At Artisphere's 1 Party, Arijit Das led a collaborative mural creation. The resulting mural is now on display in Artisphere's Town Hall. If you study this artwork careful, you might notice Euler's formula evaluated at pi (Euler's identity). Euler's formula is a key identity in complex analysis. 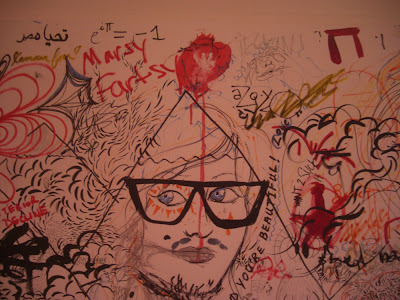 The complexity of identity is a common theme in contemporary art. This mural incorporates that theme in an sophisticated and innovative way. Such work is helping to propel Artisphere to the forefront of the contemporary art scene.